The salvage of the capesize coal carrier MV Smart in Richards Bay, South Arica has been completed more than two years after the ship ran aground, the North P&I Club and the South African Maritime Safety Authority said in a joint statement Tuesday. The complex salvage was carried out by Titan Salvage, now part of Ardent following a merger between Titan and Svitzer. 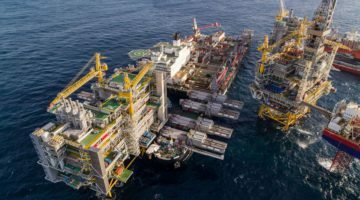 The job was completed on-time and on-budget despite challenging weather conditions, particularly during winter periods along the South African coast. The 151,279 DWT bulk carrier ran aground on a sand bar shortly after departing the Richards Bay coal terminal in a 7 meter swell. The ship, which was carrying 147,650 tons of coal, 1,769 tons of fuel and 129 tons of diesel, broke up into three pieces in the days that followed. All 23 crewmembers were evacuated safely from the vessel. Dutch salvage company Smit Salvage, part of Boskalis Westminster, together with Smit Amandla Marine and South African salvage firm Subtech Group removed the fuel first and without any spillage, followed by 10,000 tons of coal slurry in the ruptured no. 9 hold. They then refloated the separated stern section, which was towed out to sea and scuttled in October 2013. Titan Salvage won the tendering process to perform the lightening, refloating and scuttling of the partially buried bow section. The contract was unusual because of the extent to which Titan assumed the operational risks associated with the project, so minimizing the chances of a cost overrun, the joint statement from North and SAMSA said. The bow section was refloated and scuttled in December 2014. The remaining mid-section was cut down and buried at the beginning of September 2015, with rehabilitation of the seabed completed immediately thereafter. “The successful conclusion of the operation is a tribute to all parties, government departments, the local municipality, Transnet National Port Authority, insurers and salvors who, by working together as a team, reached agreement on sensitive issues through consensus without having to resort to the courts. It was important to SAMSA that the operation led to a skills transfer to South Africans, especially as operations of this magnitude are fortunately rare occurrences both internationally and domestically. Nobody benefits from incidents of this nature, but it has to be recognised that in excess of US$36 million was spent in South Africa during the two years it took to reach completion,” Campbell said.